The National Lacrosse League has announced three finalists for the 2015 NLL Rookie of the Year Award. The Edmonton Rush's Ben McIntosh, Colorado Mammoth's Jeremy Noble and Georgia Swarm's Miles Thompson were voted as the top trio of players from this year's rookie class. McIntosh led all rookies in goals (37), assists (49) and points (86) during the regular season and tied for second with 69 loose balls. McIntosh's 37 goals were tied for the 12th-most among all NLL players while his 86 points and 49 assists both tied for 14th-most overall. The first-year pro helped Edmonton to a first-place finish in the West Division and eventual Champion's Cup win. The 24-year-old posted two or more points in all 18 of his games played this year, had 11 games with four-plus points and scored hat tricks in five games. The Coquitlam, B.C. native, the first overall pick in the 2014 NLL Draft out of Drexel University, won the NLL Rookie of the Month award in both January and April. 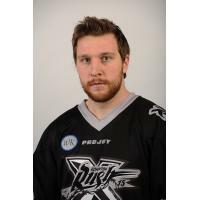 Noble, acquired by the Mammoth in a trade with the Rochester Knighthawks in early March, debuted in Week 11 and recorded 39 points (13+26) and 30 loose balls in nine games played. Noble's 2.9 assists per game average led all rookies while his 4.3 points per game average was second-highest and 1.44 goals per game third-best. Noble had two or more points in all nine games and had four-plus points in six games. The Orangeville, Ont. native, the second overall selection in the 2014 NLL Draft, was a three-time All-America selection at the University of Denver. The 23-year-old was named the NLL Rookie of the Month for March. Thompson finished second among all rookies in goals (27), assists (35) and points (62) plus tied for second with 69 loose balls. Thompson had three or more points in 13 of his 18 games played, scored at least one goal in 15 games including four hat tricks and had two-plus assists in 11 games. From the Onondaga Nation, Thompson played collegiately at University at Albany, where he was the co-recipient of the 2014 Tewaaraton Award with his brother. The 24-year-old, the third-overall selection of the 2014 NLL Draft, was the NLL Rookie of the Month in February. The 2015 NLL Season Awards are determined by a vote of the league's Board of Governors, General Managers and Head Coaches at the end of the regular season. The winners will be announced at the NLL Season Awards Ceremony on Tuesday, Sept. 29 in Toronto, Ont.